BIAFRA: SECURITY ALERT!!! GOVERNMENT-SPONSORED FULANI TERRORISTS PLANS TO ATTACK RURAL COMMUNITIES IN ENUGU AGAIN. SECURITY ALERT!!! GOVERNMENT-SPONSORED FULANI TERRORISTS PLANS TO ATTACK RURAL COMMUNITIES IN ENUGU AGAIN. A report reaching the news desk of Biafra Writers as at the late hours of Wednesday 14th September 2016, has it that Fulani men disguised as herdsmen are on their way to Enugu State for a planned attack that will be launched in the early hours of 16th, 17th and 18th of September 2016. According to our source, these men all left from Kastina State and are all heavily armed. The ammunitions arrived Enugu at the late hours of Wednesday 14th September 2014 with few men while the remaining men are pitched in Benue State. Our Intelligence Unit also revealed that this attack has been planned to commence at Aku village, Igbo Etiti local government area of Enugu State which might further spread to other neighboring communities. IPOB hereby sounds this note of warning: that further attack on Enugu or any other community in Biafra land in the disguise of herdsmen will result in a mass exodus of all Northerners from Biafra. Our peaceful approach towards the restoration of Biafra should never be taken as an act of cowardice. We call on Amnesty International, United Nations, Human Rights Watch and other human rights organizations to call the Nigerian government to order. Nigeria will surely not remain the same if the mayhem that was unleashed previously at Enugu by these terrorists is repeated. 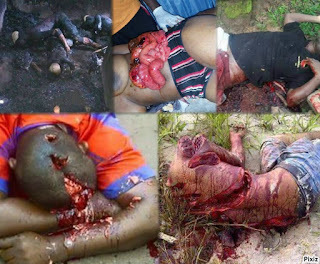 Government did not sponsor Fulani to attack Enugu Communities. Enugu People and Fulani are all Nigerian Citizens, no way should government instruct somebody to destroy or attack its citizens.